During 1947 a book was published titled, Misty of Chincoteague, written by Marguerite Henry. In 1948 I was ten years old, and that is about the time I read the book. That name of Chincoteague stuck with me through the years although I had no real idea where it was. In July 1958, when I was another ten years older, I found it to be a quaint village located on an island of the same name along the Eastern Seaboard of Virginia, only a few miles below the border with Maryland on the Delmarva Peninsula. 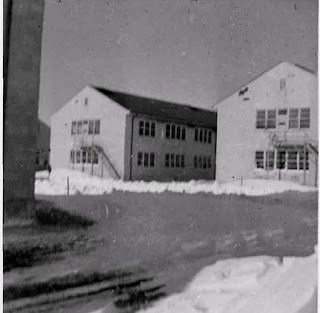 The Chincoteague Naval Auxiliary Air Station was located near the island, and my squadron, VP-8 was sent there. In December of that year of 1958 I was married and our first home was located at 108 Daisey Street on Chincoteague Island. Our landlord was Dave Daisey who owned several oyster boats, and a factory where the creatures were prepared for market. Our home was Dave’s former home next to the new one he had built on the corner. We lived in half of it, while two single friends of mine, Ron Kleven and Bob Thompson, rented the other half. We only resided there for about two months until a big change in Navy plans caused our squadron to once more be re-home-ported to Breezy Point on the Naval Air Station aboard the Norfolk Naval Base. At the same time my brother Dell, also in the Navy, received orders from Brunswick, Maine to Key West, Florida. 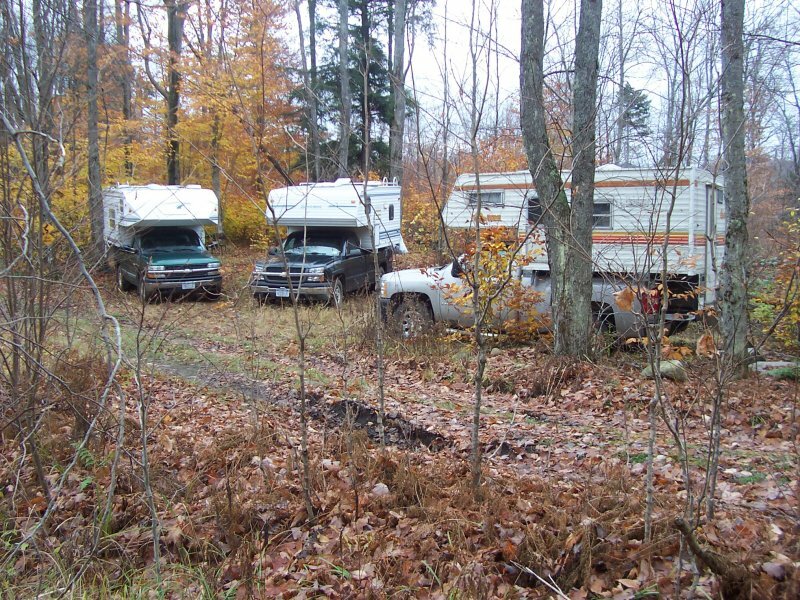 His family had recently purchased a 1953 Champion 8’ by 35’ house trailer. He was unable at the time to have it moved all the way to Key West so I bought it from him and had it moved to Norfolk, Virginia. My wife and I lived in that home in a trailer park on Little Creek Road until I left VP-8 in the spring of 1960. November 16, 1959, with a little over four years in the Navy I was awarded the rating of AMS1, First Class Petty Officer, pay-grade E-6. Base pay was $225 monthly, while I also received $22.50 sea duty pay, $77 for food rations, and $77 quarters allowance, for a total of $401.50 monthly. This was a large increase from the $78 a month of four years previously. I could even afford to swap cars, which I did, obtaining a 1953 Ford to replace the aging ’51 Studebaker. After a few months of marriage we also were able to afford to buy a used TV for $40 which we paid off in $10 installments. During that summer of 1959 I volunteered for a flight crew and began flying for a living, but we’ll let that be another tale. When I returned from Argentia, Newfoundland to the United States, Patrol Squadron Eight (VP-8) had been permanently reassigned from Quonset Point, Rhode Island to Chincoteague, Virginia in relationship to a new task assignment for the squadron. During these “Cold War” times a new concept was being developed for coastal protection. VP-8 was assigned to Task Group Alpha for long-range Anti-Submarine Warfare (ASW) with a secondary task of Search and Rescue (SAR) duties. As such we were assigned a more central location along the east coast of the United States. 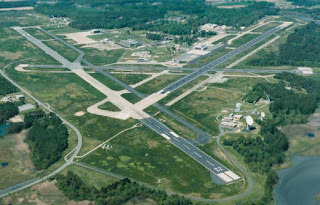 This is an aerial view of the base at Chincoteague. A first priority for me was to obtain a set of wheels for local transportation. 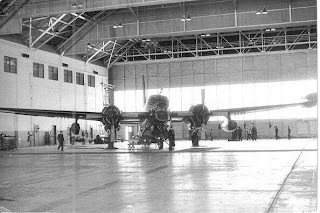 I had barely stepped off of the MATS aircraft until I learned of a 1951 Ford for sale by John D. Taylor, a newcomer to the squadron while I was on deployment to Argentia. It was located in an off-base parking lot outside the main gate of the Chincoteague Naval Auxiliary Air Station. John told me the car was financed at a finance company in Salisbury, Maryland some 12 miles from the base. I was to pay him $400 for the car which he would then go pay it off and sign it over to me. I gave him the money which he promptly used to go AWOL with. Later he was returned to our station to await Courts Martial for being AWOL. While there he signed a paper stating he would return my money, which he never did. He also collected his back pay and used it to go AWOL for a second time. I never heard any more of him. 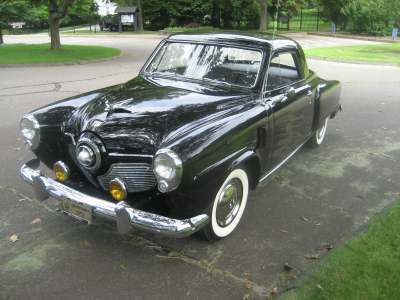 I went on leave to visit my parents and while there my brother Ron offered to sell me a 1951 Studebaker business coupe that he owned. Earlier in the year he had bought a brand new 1958 Edsel. He had owned it but a short while until one night he was on his way to work when he hit a horse with it. The horse had to be destroyed, but the Edsel was repairable. However parts were not readily available for it, so Ron had bought the Studebaker to drive while awaiting the Edsel repair. By this time the Edsel was on the road again, and I purchased the Studebaker. It was identical to this one except for the yellow driving lights. I also met my future wife working in the local J. J. Newberry 5 and 10 cent store. I have always said since then that I found her in a five and dime. Nearly every weekend from then until December I made that 750 mile, each way, trip from Chincoteague to northern New York. That December 20, 1958 we were married, and we’re still stuck with each other yet. I wrote on September 20th of the last rose of summer. When I wrote that I suspected it would be the last rose of the year for us here in northern New York. Our growing season is not the longest in the world in this northern climate. However October 24th we have three new roses on the very same rose bush in our front yard. Two are fully bloomed and the third will be in a day or two. Those two beauties near the top are for the pleasure of the ladies near and dear to me, my wife Nora, daughter Donna, and granddaughter Megan. The one nearer the bottom is special. It’s for Wendell whose birthday was today. I missed you in hunting camp this past weekend. 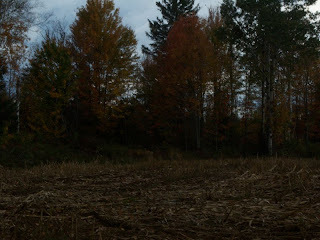 Saturday, October 22, 2011 was the opening of regular deer hunting season in northern New York. 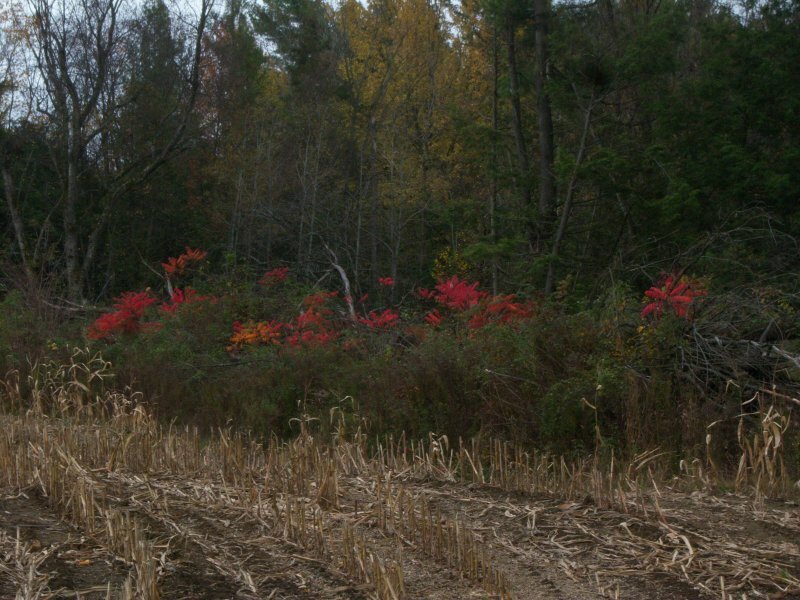 Regular season as opposed to Early Bow Season and Early Muzzleloading Season which have both passed by. We were fortunate that we had an opening day, as Harold Camping told us the world was ending the day before, but he was wrong as usual. Our little encampment looks like we circled the campers in fear of an attack though. The camper on the left belongs to my nephew Tim. His son Brian was with him in that rig. Tim's son Pat owns the center rig. Pat's brother Ben, and a friend Jeremy were in that outfit. I own the one on the right and my grandson Alex and I enjoyed the use of it. 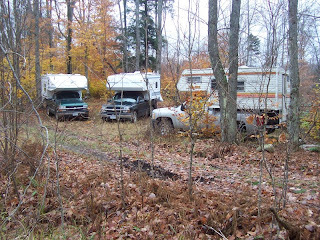 No animals were hurt or injured in our deer hunting excursion, but not intentionally. In the fall of 1957 I was attached to Naval Aviation Patrol Squadron Eight (VP-8) located at Quonset Point, Rhode Island. However, because VP-8 was home ported there didn’t by any means mean we stayed there at all times. We were always subject to deployment to places scattered far and wide. Right after the new year of 1958 began one of those scheduled was due to start. This was to be a split deployment. That meant, in this case, that three of our squadron’s aircraft would go to Spain, three more would go to Argentia, Newfoundland, while the other six would remain at Quonset Point. Of course commensurate numbers of flight staff and ground maintenance members would also go on these deployments. As a relative newcomer to the squadron, I was scheduled to remain at Quonset Point. Only a few days before the scheduled deployment a second class metalsmith’s wife was involved in a car accident. He had been scheduled to go to Argentia. I volunteered to take his place for two reasons. First I felt his wife needed him at this time, and secondly I wanted to go see some of the world, and I’d never been there before. Where was Argentia anyway? Isn’t that a country in South America? No, I guess that’s Argentina, but it’s almost like it, isn’t it? Maybe not exactly? 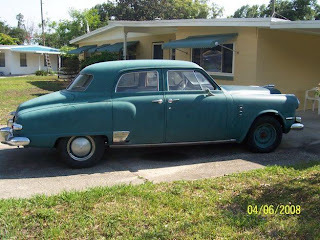 I was on my way to New York for a last visit with my folks before the three month trip to Argentia when I blew the engine in my ’49 Studebaker. As much as I liked that car, I drove it into a junkyard, and hitch hiked the rest of the way home. Upon my return to Quonset Point it was time to climb aboard a Navy Transport aircraft with my personal gear. We landed at Halifax, Nova Scotia for fuel. After a very short delay we made it the rest of the way to Argentia. Let me assure you, Argentia, Newfoundland in January is nothing at all like Argentina. The temperature was somewhere below zero degrees with a wind blowing at about forty miles per hour steady. It hardly changed during the entire time I spent there. The barracks we were assigned were wooden and rather elderly. Sometimes it seemed as if the wind blew through them as badly as it did outside. At least it was only for three months. Before our scheduled time of departure the Navy started a program for United States east coast protection that our squadron was selected to become a part of. This was known as Task Group Alpha. As such it was decided to leave the two three-plane-detachments where they were for another three months. It is for the best that they never asked my opinion of this latest idea. So it was that I stayed in Argentia for a six-month-tour. There was no liberty from this base. There was nowhere to go. I didn’t see a human female for that length of time. This photo was taken in July 1958. This last photo is a P2V aircraft in an Argentia hangar. Large aircraft, huge hangars. It was late September of 1957. I had been in the Navy now for two years, and was 19 years old. I had been through Boot Camp, Aviation “P” School, Aviation Metalsmith “A” School, and had been in a working Naval Aviation training squadron for over a year. With roughly half of my four-year enlistment over, I was due for sea duty for the remaining half. 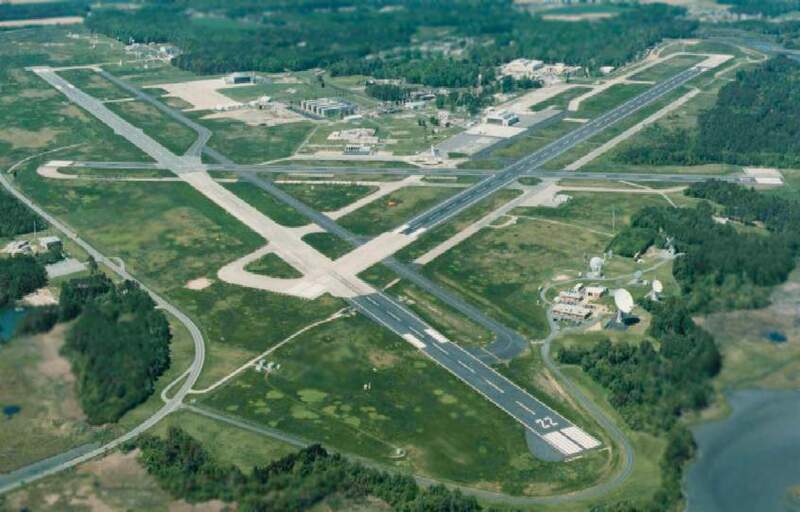 I was issued a set of orders changing my permanent duty station from the Naval Auxiliary Air station at Corry Field, Pensacola, Florida to Patrol Squadron Eight based at Quonset Point, Rhode Island. In Naval Aviation sea duty is not always onboard ships. I took some leave (vacation) in between duty stations. 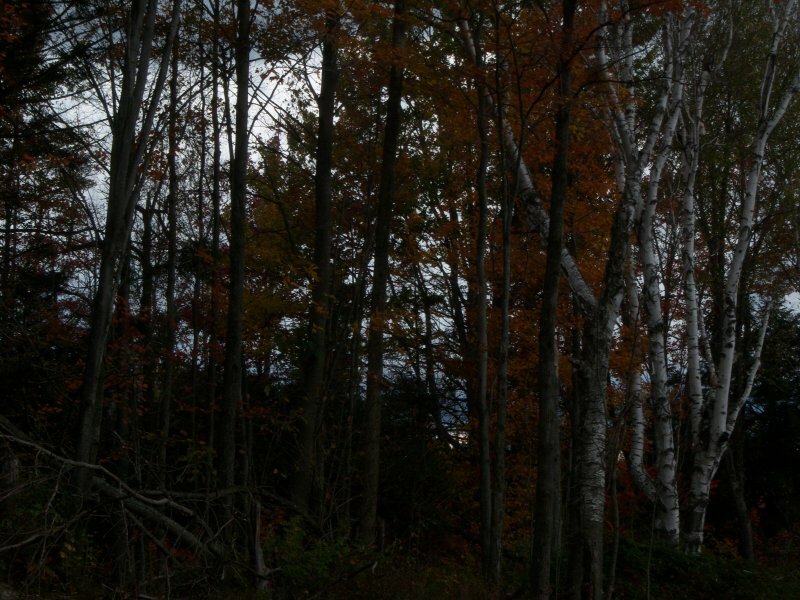 While at my parents’ farm in northern New York I hoped to buy an economically priced car. With my father’s advice and aid I located a 1949 Studebaker Commander Land Cruiser four door sedan. At eight years old it was decidedly not new, but it seemed to have a lot of good miles left in it yet. Then I was off to Rhode Island to see if I could find Quonset Point, and Patrol Squadron Eight (VP-8) somewhere on it, arriving there October 11, 1957. This is not my car, but one like it except for the color. Mine was dark blue. This time none of my old friends were sent to the same place as I. Bob MacGowan, from McCoysville, Pennsylvania went somewhere I don’t remember. Dave Smith from Woodbury, Connecticut was ordered to a blimp outfit in Lakehurst, New Jersey. Don Hillhouse wound up in Alaska as I recall. Paul Hamm, whom I had traveled to his home in Opp, Alabama with him on a couple of occasions, had left the Navy. With the Navy’s needs always taking precedence friends came and went. Soon I was checked in and attached to my new squadron and making new friends. That November 16th I was awarded the rating of Second Class Petty Officer (E-5) and placed in charge of a squadron paint crew of two other men, named Ron Kleven and Bob Thompson, both of whom became very good friends of mine. I’ve lost track of Bob, but Ron and I still occasionally exchange communications 54 years later. Ron lives in Virginia, and once back about 1988 or ’89 I managed to meet him in person once more through the efforts of my daughter. He took off from Floyd Bennett Field in New York City at 5:15 a.m. July 19, 1938 headed for his Los Angeles home in California. It seems he made a slight miscalculation and when he alit from his nine-year-old aircraft he was in Ireland. Because of the age of his machine he had been banned from attempting a trans-continental flight. Douglas Corrigan stated that he had somehow looked at his compass backwards and apparently flew in the wrong direction. He said he had been above cloud cover for 18 hours before dropping down to 1500 feet to get a sight bearing. He then found himself above water and determined he must be somewhere off the California coast. When he first saw land he decided it did not look like California, and after some thought determined he may have flown opposite from his intended direction and therefore he might be over Ireland. He searched for an airport and finally landed at Baldonnel. July 19, 1938 shall forever be known as the date “Wrong Way Corrigan” flew the Atlantic, and as the day I was born. 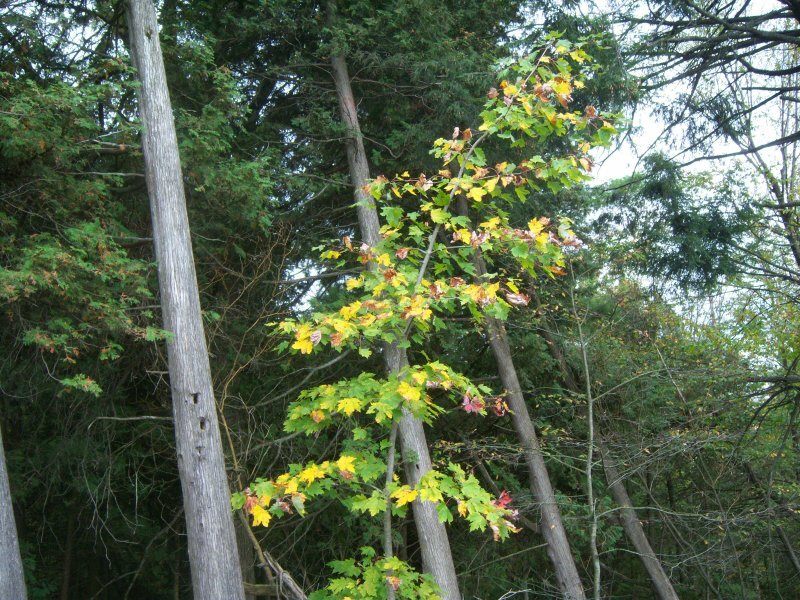 In June 1883 the magazine The Chautauquan posed the question, "If a tree were to fall on an island where there were no human beings would there be any sound?" The article went on to explain, "Sound is vibration, transmitted to our senses through the mechanism of the ear, and recognized as sound only at our nerve centers. The falling of the tree or any other disturbance will produce vibration of the air. If there be no ears to hear, there will be no sound." This question and answer does not take into consideration more modern sound recording equipment which was unknown at the time. From September 2008 through August 2011 NASA’s Opportunity valiantly traversed the 13 mile trek from Victoria Crater to Endeavour Crater on the surface of the planet Mars. During those three years Opportunity traveled on 309 days. At the end of each it took a photo of the surroundings. On October 10, 2011 NASA produced a video using the 309 photos and the sound produced by accelerometers on board the craft. This video with accompanying sound track proves that, yes, a sound is produced even though there is no one in the vicinity at the moment to hear it as there surely was no one on Mars to hear that lonely little surface traveler. If someone were to ask you to name the points of the United States of America that were furthest to the North, East, West, and South what would your answers be? Some people might answer Alaska, Maine, California, and Florida. Only one of those four choices is true. The correct answers would be Alaska, Alaska, Alaska, and Hawaii. Why? Well, we all can easily agree Alaska is the farthest to the north. Yes, we forgot about Hawaii when thinking of South, but is Hawaii actually South of Florida? Yes, easily, it is below the Equator, far South of Florida. Now we get into that tricky East and West thingy. First one would have to ask a question. East or West of what? Unlike the North and South, there are no East and West Poles to use as a reference point. The only things close to that are the Prime Meridian (North and South through England) and the Antimeridian, exactly 180 degrees from each other. If we were to call everything West of the Prime Meridian the Western Hemisphere, then the Eastern Hemisphere would have to be the other half of the world. Right? Because of the above, then you will find that the outer islands of the Aleutian Chain off Alaska extend past the Antimeridian, thus they are in the Eastern Hemisphere, and it follows they are East of the rest of the United States. Thus Alaska is more North, East, and West than any other points in the United States. As I often do I went for a ride this afternoon on the Bayou Buggy. I was not fortunate enough to make contact with any wildlife, but I did see plenty of beautiful fall foliage as we get here in the north country of New York. This first photo is a shot taken across a harvested corn field at some mixed wooded area. There’s some Birch in there, as well as some Maple and even some Pine all threw together by Mother Nature. 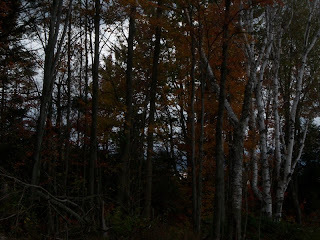 The second shot is near the first, but the Birches in this photo stood out more against a darkened sky on a dreary day. A little splash of white brightens things up. In a different area of the same field I wandered across some Sumac making a pretty bright red area among the darker colors of the background forest. 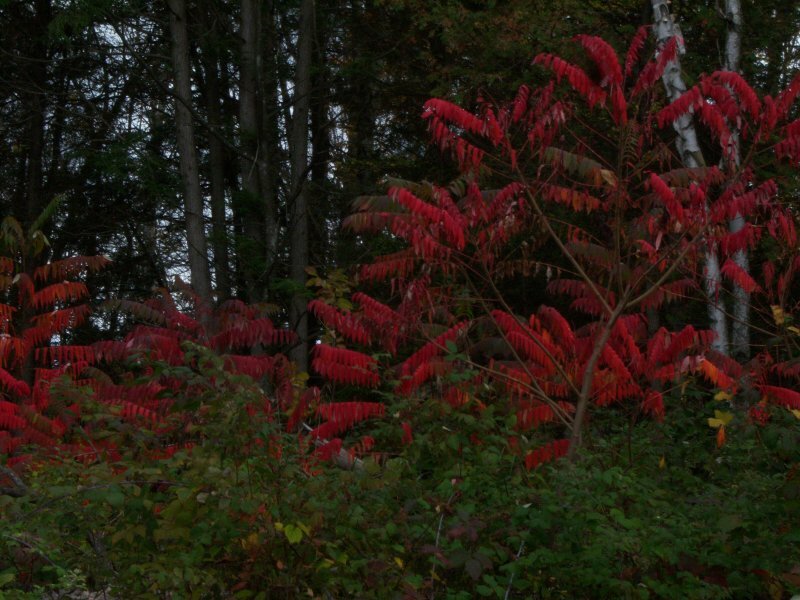 For those who may want to see a Sumac closer up, here’s one for you fine folks. That’s a couple of Birches among the evergreens behind it. We are fortunate to have such views in our area so we’ll share with you. Right after I took this last photo the skies opened up and I chose to make a home run. That is I made a mad dash for my home before getting completely soaked. My friend Don and I decided to go to a movie one night. Although the weather was rather brisk for the area, it was Florida, so how cold could it be? As we left Corry Field riding double on Don’s Triumph 650 Twin we headed east on US 98 (Navy Boulevard) heading toward downtown Pensacola. 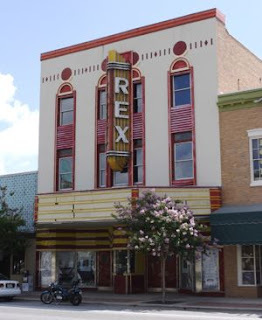 When we came to the intersection of Palafox Street we headed North, but only a very short distance as the Rex Theatre was located there on the east side of the street. All together we traveled no more than four or five miles, but due to the cool evening air we did get chilled in spite of our warm leather jackets. We were discussing what the temperature was as we rode slowly along our chosen path. We both felt it must be as low as in the forties, but we had no real way of knowing. As we parked the bike and swung down off it, I noticed that Don’s hair appeared to be frozen. He felt it, and told me it was. He then looked at me, and told me mine was also. There were no helmet laws in any of the states back in the mid-1950s, and as such we never wore them, or any other head gear for that matter. I cannot remember the name of the establishment, nor do I recall which street it was located on, but I do know it was west of North Palafox a few streets and at the northern outskirts of Pensacola as it was in 1956 and 1957. It was a drive-in restaurant that sat among a grove of trees on the west side of the street. Its popularity was undoubtedly due to its policy of hiring young female waitresses exclusively. They were magnets to the young sailor population in and around Pensacola at that time. I met one of these young single ladies, and for whatever reason she agreed to go on a couple of dates to the movies with me. It was through her that I learned of a rather unusual business practice used at the restaurant. Believe it or not the girls paid $1 an hour to work there. This was long before the days of minimum wages and such, at least for waitresses. Because this place did such a tremendous amount of business the girls earned tips far and above any they could get at any other place anywhere near there. So, a dollar of their earnings per hour still left them with far more than they could earn anywhere else, and the restaurant had a waiting list of girls who wanted to work there. I’ve no idea where one would learn the skills needed to work there. There was no parking lot management at all. The vehicles owners parked haphazardly under the trees wherever they desired. It was up to the girl working that particular area to keep up with movement, take orders, deliver them, and collect money owed. There were anywhere from 6 to 10 girls working at any given time, depending on time of night, and day of the week. Because of the heavy traffic in the area a local police officer was usually there. One night several sailors decided to have a little fun. A couple of them staged a fight near the building. The policeman rushed from his car to the scene to break up the fracas. While he was gone from his car someone chained his rear axle to a tree. Then two more guys got in their cars and proceeded to start a drag race in the street. With revving engines and a great squealing of tires they were off. The officer ran to his car, entered it, and with much gusto started after the miscreants. When he hit the end of that chain, the entire rear end of the car was instantly removed. He sat there bewildered for a few seconds. I’m sure the shock was terrible. He attempted to discover who had done the dastardly deed, but no one knew anything. Interrupting my chronological recital of my Navy career, I’m going to jump ahead a few years as this is the correct time of the year for this tale. It so happened that I was ordered to travel to Guantanamo Bay, Cuba in 1963. I left my wife and our only child in Northern New York when I left the area on July 19th, 1963. I drove to Norfolk, Virginia for further transfer to Gitmo. I arrived in Gitmo August 2, 1963 for a one year tour of duty. My first act upon arrival was to apply for an extension of that one year for a second year which allowed my family to accompany me. Second order of business was to apply for Base Housing which put me on a waiting list for a two-bedroom home. Now it was time to settle down and wait. About a month later, September 6th, I completed eight years in the Navy and was an E-6 Enlisted First Class Petty Officer (AMS1). I had taken a Navy-wide exam the previous February, and was selected as an E-7 Chief Petty Officer effective as of November 16th, which was about two months in my future. On September 26th a tropical depression formed off the west coast of Africa, and by September 29th it had evolved into Hurricane Flora located some 560 miles east of Trinidad. It passed directly over the island of Tobago with winds of 125 MPH. 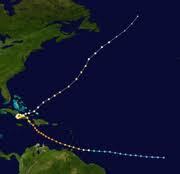 It made landfall on the island of Haiti on October 3rd with winds of 145 MPH with gusts up to 200 causing 3500 deaths. Next in line was Cuba where it struck about 30 miles from Guantanamo Bay with slightly lesser wind speeds closer to 125 MPH. Traveling northwestward past Gitmo it weakened over land. As it approached the northern coast of Cuba on October 4th a high pressure area pushed it back southward whereupon it struck our Base for a second time shortly after we had been advised of an all-clear form the first shot. After traveling into the waters of the Caribbean, south of the island where it picked up some more steam, it returned for the third time on its way northeast on October 8th. For five soggy days we dealt with great amounts of rain and wind that seemed like they would never end. Some areas of Cuba received up to 100” of rain, the highest amount of any event ever on record. Totally it was the 6th deadliest storm ever with between 7,200 and 8,000 deaths. November 16th I was initiated into the ranks of Chief Petty Officer. Six days later President John F. Kennedy was assassinated. Possibly not as memorable as September 11, 2001, but it was truly an eventful six-week period. One month later my wife and son arrived at Gitmo where we spent the next three years together, as well as our daughter born there the following February. During the last few months I was at Corry Field, located in Pensacola, Florida, I worked with a fellow named Paul Hamm from Opp, Alabama. On one occasion during night flying operations Paul decided to go for a flight riding in the rear seat of a flight instructor’s SNJ trainer aircraft. After donning a flight suit, helmet, parachute, and other assorted gear, nearly everyone looks alike. By this time Paul was becoming secure in the knowledge he had made a mistake and got in the wrong aircraft, and he was with a student, and not an instructor, and furthermore the student thought he was the instructor. As I enter the waning years of my lifetime it seems the seasons all come a little quicker and are a little shorter. So it is with this fall season. It seems only a few weeks ago it was Groundhog’s Day, with snow on the ground, and spring a long way off. Then it was May’s Memorial Day, and days later it was the Fourth of July. Soon came Labor Day and now it is October first. Where has the year gone? On September 18th I took the first photo of this series. 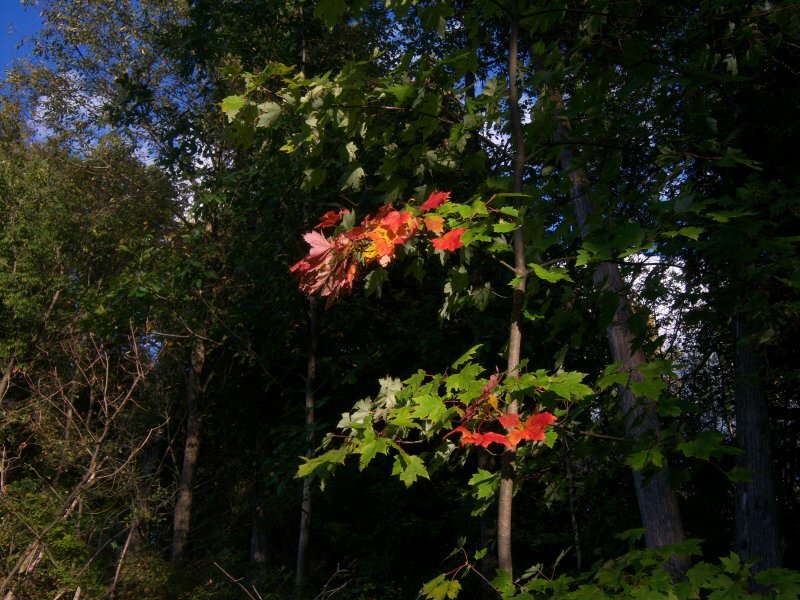 These were some of the first leaves I had spotted that were losing their green of summer to become a part of New York’s beautiful fall colors. 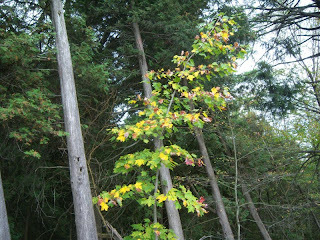 However it was only a few leaves on a single tree, so fall must be a long way off yet. Right? Fast forward one week to September 25th. The very same red leaves are yet there, but it appears the old master painter has added a goodly group of yellows to join them. 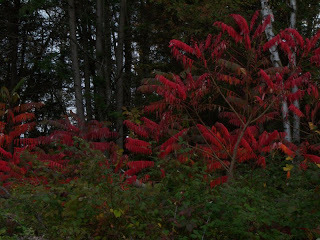 In fact it seems as if about half of the tree is now covered with colors other than green. Only a week went by as summer changed to fall. What happened? Same tree, different day! 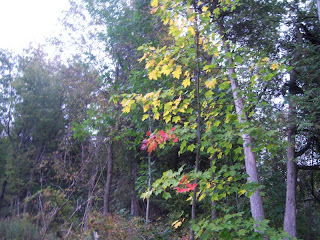 On September 27th, only two days after the last photo, the yellows are already changing to brown. 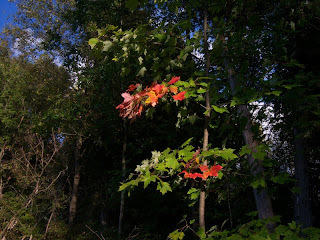 The reds can still be seen but they are fading fast. Soon they will drop to the ground to begin the change to humus for future tree growth. It’s an ever-changing cycle. Let’s hope it continues this way for a long long time.